Saxophonist Larry Munoz is since many years in music business. His love for contemporary jazz was initiated by David Sanborn. His biggest influences are David Benoit and Eric Marienthal. Like many others he earns his money in a day job, while his heart tends to music. 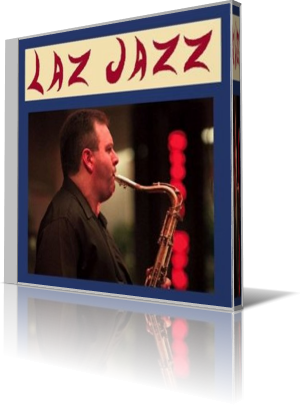 His newest project is called Laz Jazz (2013), an EP with five tunes recorded by Larry and his fellow musicians Nicole Pesce (keyboard, piano), Mel Brown (bass), Perry Senn (drums), Lisa Munoz (flute) and Dan Reed (trumpet). Larry didn't go the easy way to present a collection of cover tunes. All pieces were written by Larry and recorded by the above mentioned musicians without help of machines. Introducing tune of the album is The Journey Begins. His contemporary jazz is strongly influenced by David Benoit. The fast paced melody is perfectly accompanied by Nicole Pesce on piano. A funkier approach has the second piece Funk Latte. Larry emphasizes strong solos, not only by him, but also by Nicole on the keys and Mel on bass. On Dad's Blues Larry selects a voicing of his soprano saxophone that is not commonplace. Overall has the tune a melancholy but also homely effect. With over 7 minutes is Doom Sammich by far the longest track of the album. The interplay of the involved musicians is flawless. The length of the piece is aptly used for extensive solos. Just Before (Something Happens) closes the album. Interesting sounds the horn arrangement, that perfectly adapts to the solo presentation. Also to mention the outstanding performance of Nicole Pesce. But Larry is undoubtedly the star. Larry Munoz' album Laz Jazz prefers musical joy instead of radio-friendly compositions. A conscious decision for the contemporary jazz.